We can provide our best service to you when we understand your individual requirements. Click here to complete our online Access Registration form. The information you share with us will be added to your account at Box Office to help make future bookings quick and easy. Rear doors (Chantry Road) offer level access with sensor-operated doors that open towards you from outside. There are six accessible toilets throughout the building. Lifts to Circle level (upstairs) are located in the Foyer. Certain seats in the Stalls (downstairs) offer easier access and greater leg-room for people with restricted mobility. These include seats in wheelchair-accessible areas. Contact Box Office to book. Prelude Restaurant (upper ground floor, via stairs from Foyer or right hand lift) offers choice of chairs with & without arms, pedestal tables. Unisex accessible toilet. If you require the support of a carer or companion to access the theatre, let us know when booking. A complimentary ticket is available to Personal Assistants. Terms & conditions apply. Please check with Box Office for more details. For further details Box Office (01603) 630000 or email us. Guide/ Assistance dogs can be taken into the auditorium. Please mention this when booking and you'll be offered an aisle seat and told about any special effects that might affect your dog's comfort. Alternatively, guide dogs can be left in the care of front-of-house staff. Headsets amplifying the sound from the stage are available to borrow from the Welcome Point in the Foyer. For patrons with hearing aids we offer necklace hearing loops. An induction loop is fitted within the auditorium. If you have a digital hearing aid, please check with your audiologist that your hearing aid is loop-enabled for use at the theatre. - Certain shows will be signed. A signer stands on or near the stage throughout the performance interpreting the show into British Sign Language. - Certain shows will be captioned. Screens to either side of the stage relay the words and lyrics as they are delivered. Sound effects are included. - Certain shows will be audio described. A description is given live throughout the performance of the visual aspects of the show. Patrons requiring this service wear discreet headphones (supplied on free loan from the Welcome Point in the Foyer). Where possible, an audio introduction (describing the settings, characters and costumes) will be available to download from our website 10 days beforehand and we’ll invite you to join us at a touch tour on stage (to explore the stage space, set and selected props and costumes). - Audio introductions may be available, on request, for shows which are not audio described. These are available from the third performance onwards of a show. Please pre-book at least one week in advance of the show by telephone to the Front of House office on (01603) 598540 email us. Below is a short film about Audio Description, created for Mind's Eye by Vincent Abbey Photography. Touch tours are offered before most audio described performances. They offer an opportunity to visit the stage and explore the space under the guidance of the Audio Describer. Selected costumes and props may also be available for patrons to touch. An invitation to join a touch tour will be sent to everyone booking for the audio description service. The tour is FREE and lasts about 20 minutes. Please let us know if you're coming to the tour on your own as we will arrange for a member of our front of house staff to accompany you. - Certain shows will be advertised as having a ‘relaxed performance’. These offer a supportive and relaxed environment throughout the theatre and are especially suited to those with autism and a wide range of disabilities. - Patrons are free to move around and to make noise during these performances. Members of Autism Anglia work alongside our trained staff at these performances. - Please note that these performances cannot be booked online. We’d like to speak with you when booking to ensure we fully meet your needs. - Contact the Box Office 01603 630000 to book tickets or Front of House to ask a question to discuss a pre-visit. - Click here to view our latest Visual Story for Aladdin. - Norwich Theatre Royal has joined Norwich City Dementia Action Alliance collaborating with a growing number of local organisati ons and businesses who together are working towards making our fine city a dementia friendly one too. - As part of our membership, we have committed to an ongoing staff training programme to raise awareness and understanding of dementia. We are also investigating ways of making what we do dementia friendly. - Dementia-friendly performances offer a safe and relaxed experience for those living with dementia. Theatre staff have received awareness training to become Dementia Friends and will be supportive and understanding in their welcome. - During the performance, the lights inside the theatre will remain on at a low level, sound levels will be monitored and any special effects softened to ensure the experience remains comfortable for everyone. Depending on the nature of the production, performers may interact directly with the audience, encouraging people to sing-a-long if there are well-known melodies. - Please Note - Dementia-friendly performances are not available to book online. - If you or a loved one is affected by dementia and you would like help in planning a visit to Norwich Theatre Royal please contact our Box Office on (01603) 630000 or e-mail us. 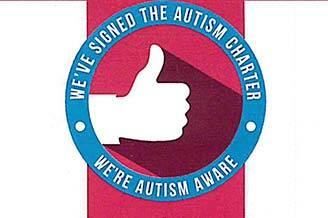 We have signed up to the Autism Charter which has been co-produced with people with Autism to work towards becoming a more aware and accessible venue. Click on the logo to see the full certificate.